For completeness I have included the COT Index for the New Zealand although one has to exercise caution when viewing this data. 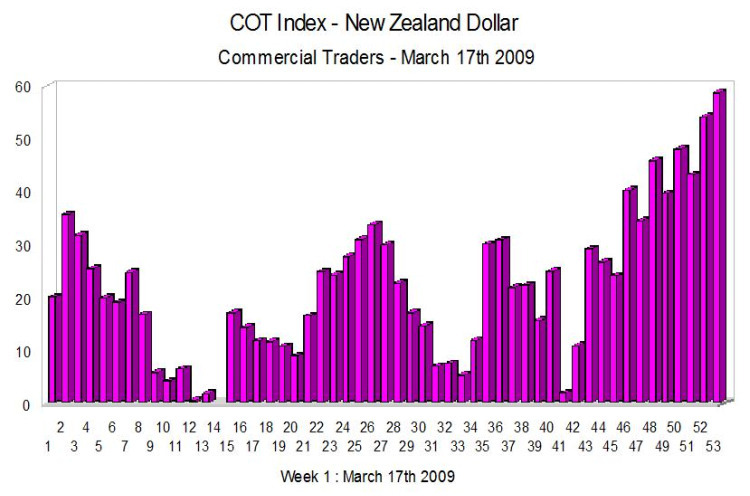 The prime reason is that liquidity in the New Zealand Dollar is relatively low given that its primary attraction for currency traders was in the carry trade and in particular against the Japanese Yen. A quick look at the New Zealand Yen pair shows a clear correlation between a major turn in the index and the start of the “great unwind” of the carry trade. This is not shown on the current chart as it occurred outside the 52 week period under consideration and since then an extreme of 95 to 100 has not been achieved hence the peak of the chart is currently only displaying as 60 at the moment. Recent price moves in the New Zealand Yen pair would suggest that we may be seeing a resurgence in the New Zealand in the next few months especially as it did not take out the low of 42.47 last posted in late 2000. All the fundamental news is now available in the economic calendar.